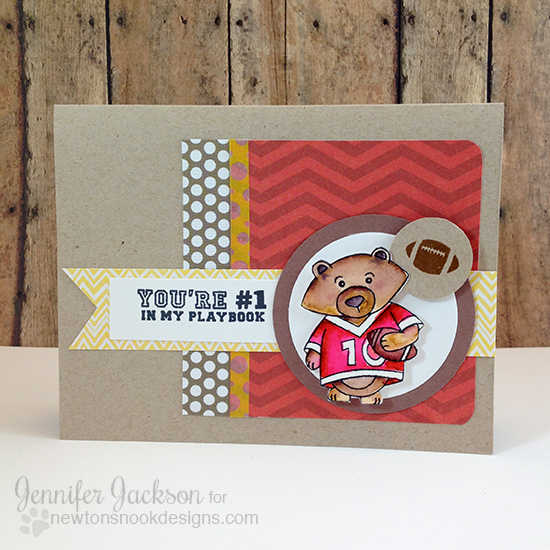 Newton's Nook Designs: Winston is a Football Star! I had so much fun with the little image of Winston playing football from our new Touchdown Tails stamp set that I made a bunch of cards with it. It was so fun to color him in different colors! NND headquarters is in Wisconsin so for this card I chose the Wisconsin Badger colors of red and white for his jersey! I stamped him onto watercolor paper and colored him with some zig clean color watercolor markers - I'm still learning how to use these - as you can see I don't have them completely under control and went out of the lines a couple of times - but I figured that's part of the fun of watercolor - it doesn't have to be perfect! Then I added on some fun pops of yellow paper and washi tape because I felt like the card needed another color. 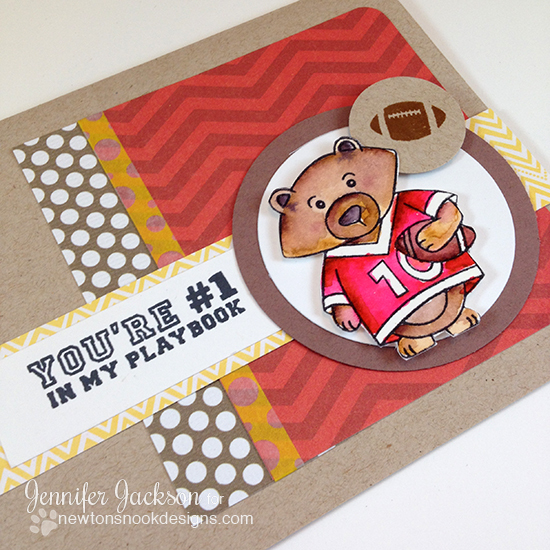 I also stamped a little bold football and added it next to him for fun! For the second card today I also used the same image of Winston from the Touchdown Tails stamp se tbut this time I colored him in Packer colors - that's our favorite team! I also colored this images with the watercolor markers and then added in a bit of distress ink on the edges of the paper. 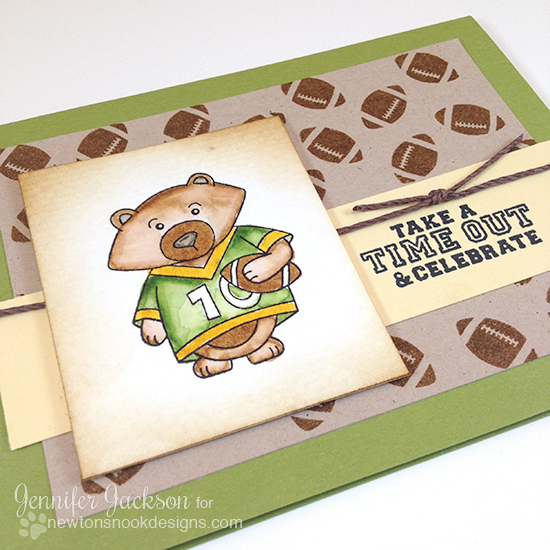 I created a fun football background by stamping the little bold image a bunch of times on the kraft paper and then added the "take a time out and celebrate" sentiment on a little banner with some twine. Thanks for stopping by! I hope you enjoyed my cards today! 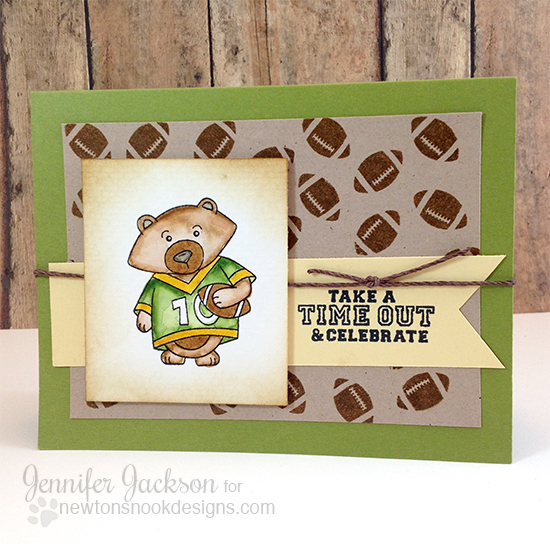 If you like this new Touchdown Tails stamp set you can find it in our shop! Oh how fun are these cards!! Love this new football set!! Absolutely adorable, Jen! Winston is fabulous and the little football...oh my! Crushing all over this! Way too cute!!! Love both cards! Just received this set today, and I can't wait until I get my homework done, so I can go craft!!! Both of your cards are absolutely adorable! Winston makes such a cute football player! And I must say, being a new football fan, I rather enjoy watching the Packers play. They're a fun team to watch!